Have you ever looked at others in and around your life and sort of, well, secretly coveted where they were in their lives and wished that you were where they were or had what they had? Come on, let’s be honest. Haven’t you wondered what it would be like to be further along in your life where you could be living from the fruit of your labors NOW, instead of in the future? For all of us who are living in the real world, the answer is a huge – and quite possibly a little resentfully – YES! I mean, who would not want to be further along in accomplishing their goals, having their dream soulmate, or experiencing an abundance of worldly success? I know I have. Here is what God has spoken to me concerning my life journey. I hope that it will speak to your heart as well. Never negate the value of your life and how it can positively affect the world around you. He can use you exactly where you are in life, doing exactly what you are doing, and and all of it is a part of His continual preparation and refining of your life for the great things He has called you to. No matter how painful, how revealing, how embarrassing or humbling your life has been in recent times; no matter how sad, how tragic, how great, or even how average it may seem to be. Your life matters and your story matters. You were created for things that are exceedingly abundantly above and beyond anything that you can ask or even think. Live every day with focused intent on discovering what you were put on earth to do. Resist the temptation of coveting another person’s story, and keep writing your own story. Your story is a masterpiece and best seller that God will use to change the world around you, and bring glory to Him. Keep writing your own story by living your life for God and doing those things you know you have been called to do. 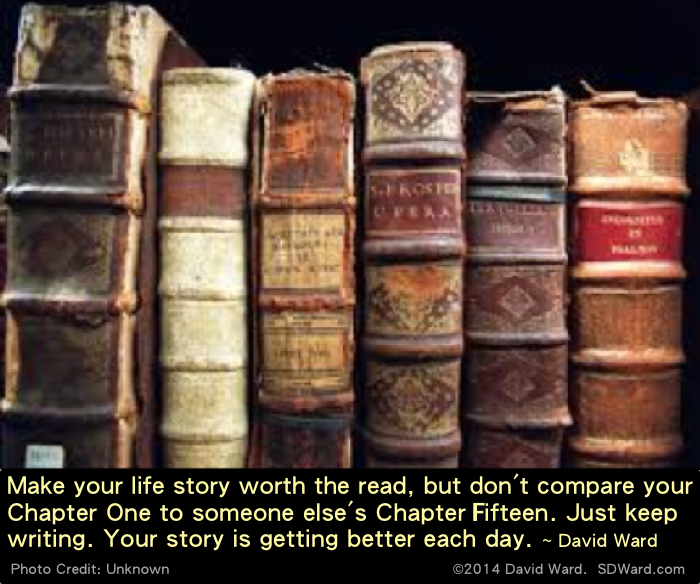 The chapters of your life will fill up your book, and it will be a great read!